Whether you’re starting out from scratch, relaunching your business with a new brand identity or want to optimise you hotel marketing strategies to gain more bookings, there’s plenty to consider when it comes to hotel marketing strategies. In this article you find a list of 9 essential marketing strategies to consider when deploying your direct sales and online marketing strategy. Your website is the most important distribution for your business and the crux of any good online marketing strategy. No matter which hotel marketing tactic has directed a potential customer to your website, this is the place where people can learn more about your individual business and decide whether or not to book a stay with you. It’s also the only online distribution channel where you can generate direct online sales, so it’s crucial your website has a booking engine to handle self-service reservations. As more internet users rely solely on their smartphones and tablets, a mobile friendly website is necessity these days. There’s no point in having a website if its difficult for potential customers to find via their preferred search engine. Make sure you’re following SEO (Search Engine Optimization) online marketing basics like ensuring your content is rich and relevant, with strong keywords and keyword combinations that give your website the best chance of being clicked upon. Consider likely search terms when planning your hotel marketing SEO campaigns and don’t forget to combine your main keywords with strong secondary ones like the name of your local neighbourhood or district. More tips about how to rank your website higher in Google are described in the article “5 SEO Tips for Hotels to Improve your Ranking in Google”. To really contend with the competition, your hotel needs to offer something unique and distinctly different to entice potential guests. Your hotel marketing campaign needs to be equally individual. Quality customer care needs to be at the core of everything in the hotel and hospitality industry. Going that extra mile for your guests can yield massive returns. Make sure you’re doing something different, from providing customers with a little treat at check-in, to nabbing local press and PR connections to shine a light on hotel marketing events. One surefire way of securing new customers is to get your hotel listed with local tourist offices. Whether it’s a printed flyer in a bricks and mortar office, or a prominent link on a local tourism website, you’re guaranteed to take premier listing over many rival competitors. If you’re looking to appeal to the business traveller, nearby convention and exhibition centres are also a great place to promote your hotel. It’s also worth talking to local marketing and event companies in the region as many of these may only offer part-package deals to their own customers, meaning you can cover the accommodation needs and bolster your bookings in quieter seasons. In the modern digital age, no hotel can secure regular business without capitalising on online travel agencies and travel brokers. A simple listing can generate thousands of bookings in the long-term, but it’s worth remembering that each time a booking is generated through such an agency, a commission will be applied. 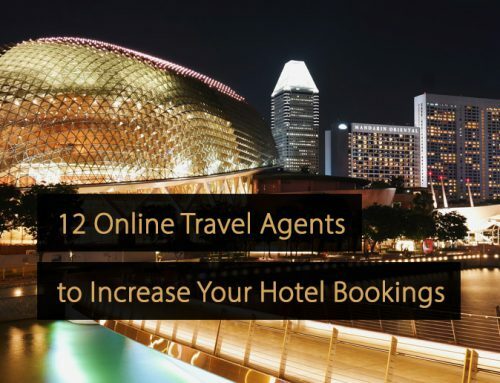 Never rely solely on online travel agencies when it comes to your hotel marketing efforts, ensuring such websites are used to generate additional sales, rather replace your direct sales efforts entirely. Find more detailed information about online distribution channels in the articles “The Most Important Online Distribution Channels for Hotels” and “Hotel Distribution Channel Manager: What Are the Advantages?”. A GDS system (Global Distribution System) is a network that enables automated transactions between travel service providers (airlines, hotels, cruises and car rental) and travel agencies. When connecting your hotel to a GDS provider your hotel can be booked via hundreds of travel agencies worldwide. You can also use such systems to target specific travellers, including those venturing from home turf on business. More detailed information about GDS systems and what the benefits are for hotels, you can read in the article “Global Distribution System (GDS): What Are the Benefits for Hotels?”. When it comes to hotel marketing, you should always take best practice in hospitality out into the field when promoting your business. If a local business is regularly recommending you to potential customers, make sure you’re maintaining a mutually beneficial relationship with strong incentives. Appointing a dedicated sales representative is definitely worth considering for hotel businesses looking to expand. Any good rep should be taking stock of potential companies in the area worth making a connection with, while ongoing procurement efforts to lock down new partnerships should be at the forefront of any hotel marketing effort. If you’re not utilizing social media in your online hotel marketing campaign, start now. It’s free to create accounts with the likes of FaceBook, Twitter, FourSquare, Instagram and YouTube and it’s never been easier to create dynamic social media pages in moments. However, there’s no point launching a social media presence if you don’t mean to maintain it. Make sure you’ve got at least one person appointed to keeping your hotel marketing social media message live and engaging. Fresh content is pivotal, so make sure you’ve got a content delivery schedule. If you’re strapped for time to create new content, consider launching a hotel blog you can link back to from your social pages regularly. More social media tips about how to promote your hotel, you can read in the article “7 Social Media Marketing Tips to Promote Your Hotel”. A great review can earn you a new customer. A poor review can cost you hundreds. Try to encourage better reviews and recommendations from previous guests by engaging them after checking out. Your hotel could feature dozens, if not hundreds of times on review websites, so you need to ensure that each page is loaded with positive reviews and complimentary content. Monitor reviews on the most popular sites, taking note of any bad reviews and engaging dissatisfied guests with helpful and constructive feedback. Neutralise negative feedback wherever you can. Find more detailed information about managing online reviews in the article “9 Tips to Manage Online Hotel Reviews”. For hotel owners and others operating in the hospitality industry, it is essential to find ways to stand out from rivals and appeal to potential customers. One of the best ways to do this is to deliver tailored, individual marketing messages. In the article “5 Ways Personalisation Marketing Can Benefit the Hospitality”, you will find out more about how to achieve this through personalisation marketing and learn about some of the ways this concept can improve marketing efforts and revenue generation. For marketers operating in the hospitality industry, there are a wide range of hotel marketing strategies to turn to. In the article “Hotel Marketing; The Latest Trends in the Hotel Industry”, you will learn more about latest hotel marketing trends.